Isaac Arnold, The Life of Abraham Lincoln, p. 157-158. William E. Barton, The Life of Abraham Lincoln, Volume I, p. 409. Noah Brooks, Abraham Lincoln: The Nation’s Leader in the Great Struggle Through Which was Maintained the Existence of the United States, p. 185-186. Lord Charnwood, Abraham Lincoln, p. 156. David Herbert Donald, Lincoln Reconsidered, p. 238-239. Don E. Fehrenbacher, Prelude to Greatness: Lincoln in the 1850s, p. 146. Don E. Fehrenbacher, Prelude to Greatness: Lincoln in the 1850s, p. 154. Emanuel Hertz, editor, The Hidden Lincoln From the Letters and Papers of William H. Herndon, p. 76. Josiah G. Holland, Life of Abraham Lincoln, p. 212. Harlan Hoyt Horner, Lincoln and Greeley, p. 165. Lord Longford, Abraham Lincoln, p. 76. Reinhard H. Luthin, The Real Abraham Lincoln, p. 210-211. Herbert Mitgang, The Fiery Trial: A Life of Abraham Lincoln, p. 50. Mark E. Neely, Jr., The Last Best Hope on Earth, p. 54. 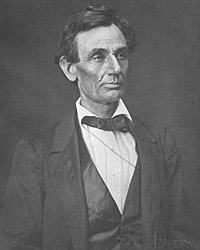 Allan Nevins, The Emergence of Lincoln: Prologue to Civil War, 1859-1861, Volume II, p. 185-186. John Hay and John G. Nicolay, Abraham Lincoln: A History, p. 140. John Niven, Salmon P. Chase: A Biography, p. 215. Stephen B. Oates, Abraham Lincoln: The Man Behind the Myths, p. 78. Alonzo Rothschild, Lincoln: Master of Men: A Study in Character, p. 115-116. Nathaniel Wright Stephenson, Lincoln, p. 95. William O. Stoddard, Abraham Lincoln: The Man and the War President, p. 175. Josiah G. Holland, Life of Abraham Lincoln, Volume I, p. 341. Kenneth J. Winkle, The Young Eagle, p. 306.